"Humans are different from other species in that they can think and adapt spontaneously when necessary. So survival becomes a 'process'. Most of us, however, take this process for granted in our daily lives. We become so familiar with our surroundings and habits that the skills we use are second nature to us. We don't even think about what we are doing. But in the wilderness, few are actually prepared to survive, even for just one night. No one believes survival will ever become an issue for them; that always happens to someone else." February 16, 2006 1400 PST (FTW): In October of 2005 NYC Peak Oil Meet-Up took a wilderness survival course at Stone Ridge in Clarksville, NY, instructed by Barb Stone. The skills taught included starting a fire without matches, shelter building in the woods, and avoiding hypothermia. Much of what we learned, and then some, is echoed by Dale Allen Pfeiffer in "A Matter of Survival. "1 Many of us had hiking or camping experience, but now we would practice stepping into the wilderness with minimal amenities. It was a three-hour drive upstate from Manhattan so the group set up a car share system. I left Long Island at 5:30 a.m. and headed into Brooklyn to pick up Jenna and Ernesto. The ride was filled with conversations about how each of us had discovered Peak Oil, our spiritual or philosophical outlook upon what is destined to come, and how difficult it has been to bring up the issue with those whom we love. The resistance we've encountered from loved ones, whether we realize it or not, has forced each of us to search for an extended family of aware individuals. We made it to Stone Ridge by 10 a.m. and walked into the garage of a home that resembled a traditional red barn. We were the last to arrive. Our group totaled four men and four women, and in front of the room was Barb Stone wearing a T-shirt that said, "Becoming an Outdoors Woman." She specializes in teaching outdoors skills to women and groups. After some basic safety information, fire was first on Stone's agenda. Heat, oxygen and fuel are the three elements required to start a fire. We were provided with a flint and steel to produce the spark (heat) that would start our fire. Stone briefly went over how a bow and drill can be used to make a fire, but said she doesn't teach "primitive" forms of survival. The flint and steel turned out to be difficult enough for our group of city-slickers and suburbanites. Stone showed us both man-made and natural materials that could be used as tinder. Canadian thistle and milkweed are two natural sources, but they burn awfully fast. Cattail, which can be found growing along any wetland, is a natural tinder that does not burn as fast. The key with tinder is to break it up into fine fluff leaving no clumps. The fine paper-like curls on birch trees are loaded with resins that burn easily. Pine needles can be used as well. Man-made tinder includes cotton balls, clothes dryer lint, sawdust and Sterno. Stone continually stressed the importance of preparation: she never goes into the wilderness without brining her own tinder protected in plastic bags. Once we had accumulated and broken up our tinder, we went into the woods. With the instep of our boots we cleared the ground down to bare dirt, assuring that our fires would remain contained. Then we collected firewood. Stone said it is critical to collect very fine pieces of wood - as thin as paperclips if possible - because the tinder catches the spark, creating a flame, which spreads to the small pieces first. We were not to collect wood thicker than our pinkie fingers. Our task was to light a fire that would last for ten minutes and leave a bed of coals. The best among us was able to keep his fire going for five minutes without producing a bed of coals. Many of us made the mistake of packing our tinder tightly into one big clump after we had spent ample time breaking it up into fine fluff. This prevented it from igniting well enough to spread. My fire lasted a mere ninety seconds because the wood I collected was too big and I had stacked it too tightly, preventing oxygen from fanning the flames. "So, do you see the discipline that it takes to find the right wood as opposed to just using whatever you've got?" asked Stone. She allowed us to make our mistakes without intervening, believing it to be the only way we could truly learn. It also provided her the platform to point out what we were doing right and wrong. "Now imagine you were in a survival situation. Just think of the anxiety you would feel," warned Stone. The experience was quite humbling for us all. Before going into the woods again, Stone led us in a discussion about shelter building and materials. The typical shelters one could build were A-Frame, Lean-To or Tarp shelters. Certain overhangs can provide protection from the elements, as can a hollowed out log. As a last resort, one can pile up a mass of leaves and simply burrow into it.2 That should be enough to survive the night. In groups of two we worked on a one-person shelter. Each pair was limited to a small section of the woods in which to find supplies and set up. Most of us went with an A-Frame design or some modified version of it. The spine of our shelter - that is, the main support branch - would have to be strong enough to support our own weight if we leaned on it with one arm; the ground in front of our entrance needed to be suitable for a fire; and we had to complete it within one hour. 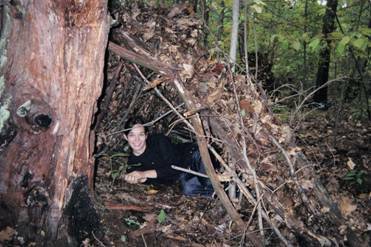 Rob, my partner, found two small living trees growing close together that enabled us to build a relatively tall shelter. Tall is not ideal, but it was the best base we could find to build upon in our area. We collected wood and used the biggest pieces we found to provide multiple supports as opposed one main spine. We then used smaller branches and twigs to create a tight web across the supports. Finally, we stuffed the open areas with leaves and small twigs like a squirrel building its nest. The fact that the leaves were wet helped keep them bunched tightly together. All of our shelters were quite well done. It was a relief to have seemingly succeeded after our fire failures. But there were a number of problems that we were unaware of which Stone pointed out during the critique. The biggest problem was that they all failed "the rain test"; a watering bucket was poured over each shelter revealing just how inadequate they were. "You need at least three feet of leaves to stop the rain," said Stone. "But you only gave us an hour?" I asked in surprise. "I wanted you to see what can be achieved in that time," responded Stone. In the Northeast, it is best to build your shelter with its opening facing north, east, or northeast since our weather blows in from the southwest. If the entrance faces south or west, wind may blow the fire into your shelter. It is also wise to set up your shelter on high ground if possible, to avoid the consequences of flash flooding from quick and heavy rain. If you must set up shelter at the bottom of an incline, you may have to build a blockade to prevent such an occurrence. Leaves are fine for this purpose as long as you use enough of them. It is also important to avoid setting up shelter under a dead tree that has not yet fallen. Stone called such a tree a "widow maker." A strong wind could bring down branches or limbs that may damage your shelter, or worse. The section on hypothermia and clothing was taught in a classroom setting. A video was shown on how easily hypothermia can set in. On a 50 degree day, if you fall in 30 degree water, hypothermia can set in quickly and kill you. Most people realize that your core needs to be kept warm - that is the area from your neck to lower abdomen - but they do not realize that it is equally important to keep your kidneys (lower back) tightly covered as well, to keep your core temperature from dropping. When choosing materials to wear in the wilderness, Stone said the bottom line is no cotton ever, unless it's blended with other materials. "Cotton kills," said Stone. Her disdain for cotton was unabashed. Cotton can hold up to 50% of its weight in water, which is great for towels, but exposes one further to risk of hypothermia when worn in the wilderness. Wool is excellent but itchy, so it is best when blended with other fabrics. Wool moves sweat away from the body without letting water in. What Stone stressed the most, which was quite ironic for our Peak Oil group, was that synthetic (oil-based) fibers are the best fabrics for the outdoors. These include polyesters of all sorts, nylon and gore-tex. But the problem with gore-tex is that it only works for cold, dry weather. Those are the conditions where gore-tex will allow sweat to pass from the inside out. If it is humid, gore-tex will hold in sweat until you become wetter than it is outside. And if you are wearing a gore-tex jacket while sitting near a fire burning pine wood it will be ruined. The pores clog and the technology no longer works, not even in cold and dry weather. All of the best fabrics for survival are made from oil except wool. After Stone passed around her favorite oil-based fabrics while reciting military information on each one, I thought it was time to inform her why all of us had taken this course in the first place. At the beginning of the class Stone asked each of us why we came and what we hoped to get out of the experience, but none of us mentioned Peak Oil. Now I described to Stone that most of the group was with NYC Peak Oil Meet-Up, that the world was about to start running out of oil, and that we all envisioned a time coming (soon) where there would be fewer amenities and the skills she was teaching might play a critical role. Stone was shaking her head up and down rigorously in agreement, but she had never heard the term "Peak Oil" before. "Oh!" she exclaimed in amazement, "When you said you were with 'something-oil' I'm thinking what interest group is this?" "Just think, no polyester, no nylon; it'll have to be ALL WOOL Barb!" I said half in jest. Wool and wool-blends will likely be the best (and only?) materials to wear for the outdoors, along with leathers and other animal skins, as oil-derived fabrics skyrocket in price. I asked Stone about foraging for food. The course we were taking was designed as an introduction to individual survival in the wilderness for one night. Stone said there is no time to forage for food when you are busy making a fire and building a shelter to survive till morning. She has sat in the back of edible plant classes many times. "All of the edible plants taste the same to me," she explained. "They taste like dirt." The overnight stay in the wilderness - which is the final aspect of the certification taught by Stone - is designed so that you will never go into the woods again without being fully prepared. Stone respects the wilderness by recognizing it can be deadly. That is why she makes sure she is prepared prior to entering it. When a student is getting his or her overnight certification from Stone, she says, if you smell beef or Chinese food in the air, it's coming from her camp. Many of us showed up with a sense of desperation but we left with a sense of empowerment. There were so many golden nuggets of information that we received, but what was most important was the interaction with other aware individuals. For example, Elise told me she was spending all of her disposable income on Peak Oil preparation: self defense classes and a sustainable agricultural conference in Vermont were her most recent expenditures. NYC Peak Oil Meet-Up members are finding similar events every month and those who are taking responsibility for their own lives are recognizing promising opportunities to learn. Now is a time of preparation and no one is going to do it for you. It is anyone's guess as to how long this blessed time will last. Barb Stone has over twenty years experience hiking and camping in the Adirondack Mountains of New York State and more than eleven years teaching wilderness survival safety skills. In 1989, she successfully completed a 60-hour survival course culminating in a solo overnight in the Adirondacks during Hurricane Hugo. As a result of her experience, she realized a real need existed for others to learn these skills, especially women. 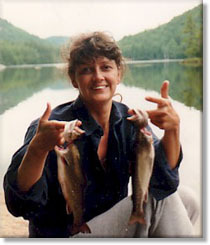 After a two-year apprenticeship, Barb became an instructor of wilderness survival skills with a local rod and gun club. She became certified in first aid and adult CPR and licensed as a NYS Guide in Hiking and Camping. She became acquainted with the Becoming an Outdoors Woman (BOW) program in New York in 1995. BOW is a National program designed to introduce women to outdoor activities and build their confidence and self-esteem. The following year she introduced wilderness safety and survival courses to the BOW Program in which she volunteers as an instructor each year. She also serves on the BOW Planning Committee and continues to promote wilderness safety awareness as a former member of the Board of Directors of the NYS Guides Association (NYSOGA). 2 Odysseus does this in Book V of Homer’s Odyssey. –Ed.